When my father Jimmy Cornell told me about his idea for a Blue Planet Odyssey I was hooked straightaway. It was 2012 and we were on a plane heading to the States for the Annapolis Boat Show to give a series of cruising seminars. I knew exactly what he meant. Almost forty years before I had sailed as a kid with my family to Tuvalu to witness that nation’s independence celebrations. Few people back in the UK had any idea where those islands were in those days. By 2012 everyone had heard of them, as rising sea levels threatened to obliterate this tiny nation whose people once gave my sailing family such a warm and genuine welcome. Maybe it was a crazy idea. But nearly three years later here we are: the Blue Planet Odyssey yachts have just made their longest ocean crossing from the Galapagos to the Marquesas and have spent three weeks cruising amongst some of the most beautiful islands in the world. Our sailors have linked up classrooms in the United States and the Pacific via Skype chats, deployed scientific instruments on behalf of UNESCO, and are planning what assistance they can provide to local communities hit by Cyclone Pam when the rally stops off in Vanuatu later this summer. I think I know my father pretty well, and if there is one thing he can do, that is turn a crazy idea into reality. 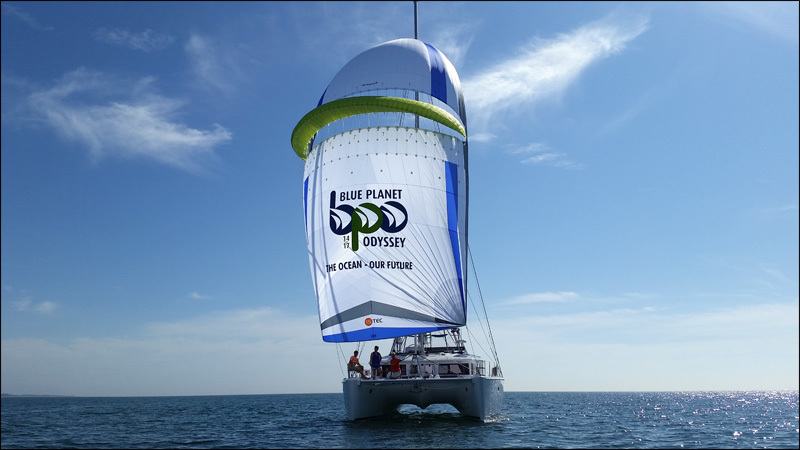 The Blue Planet Odyssey started in January 2015, with a group of yachts leaving from Key West, Florida, with another start from Martinique for those who were already cruising and preferred to begin in the Caribbean. Stopovers in Montego Bay, Jamaica and the San Blas Islands were followed by the fleet coming together in Panama for a transit of the Canal. For this first part of the rally, the yachts were joined by those taking part in the Pacific Odyssey, run from the Caribbean through to the Marquesas and designed to ease a route through the notorious red tape of the Canal transit and the Galapagos Islands. Entry formalities into the latter have recently become even more draconian in an effort to preserve these islands’ unique environment. Yacht’s hulls are now inspected by divers on arrival, in a measure designed to combat invasive species. 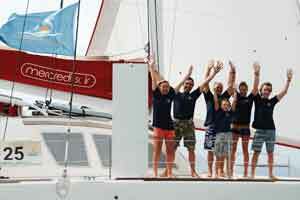 If not spotlessly clean, they may be turned away, as had happened to several yachts shortly before the Odyssey arrived. The amount of growth a hull picks up in a week of sailing in warm waters surprised our sailors who inspected their hulls a hundred miles out. Several hours of valiant scrubbing in the open ocean paid off as all the Odyssey boats passed their inspections with flying colours. 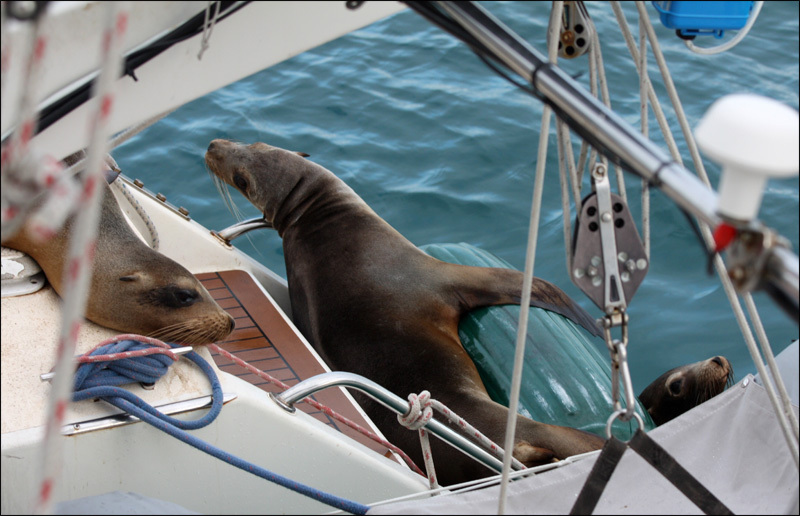 However, there has been a noticeable drop-off amongst individual yachts sailing to the Galapagos, no doubt due to the expense and complexity of these formalities. 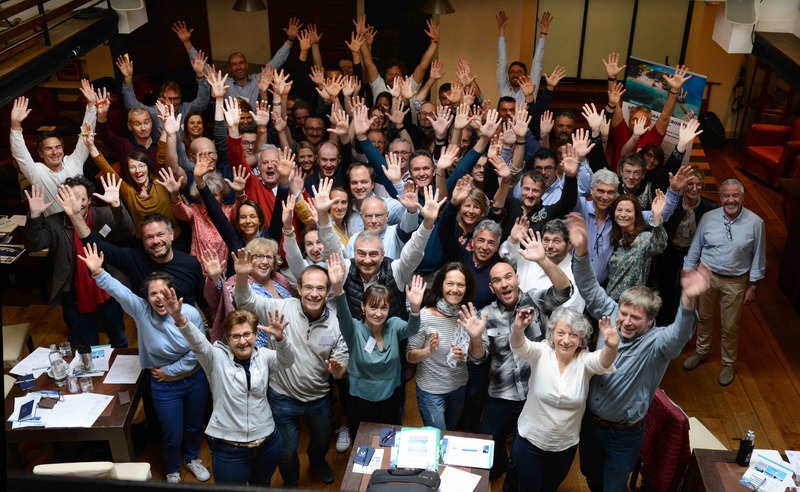 The Blue Planet Odyssey sailors, many of whom are American, come from a range of backgrounds and experiences, but are all united by the desire to fulfil a dream of sailing around the world while at the same time doing that ‘little bit more’. One Blue Planet Odyssey participant, whom Jimmy and I met in 1986, when he sailed in the very first ARC, is Zeke Holland. He teamed up with fellow software engineer Bill Dickson and doctor Tim Liveright to acquire No Regrets, an older Atlantic 42 catamaran. 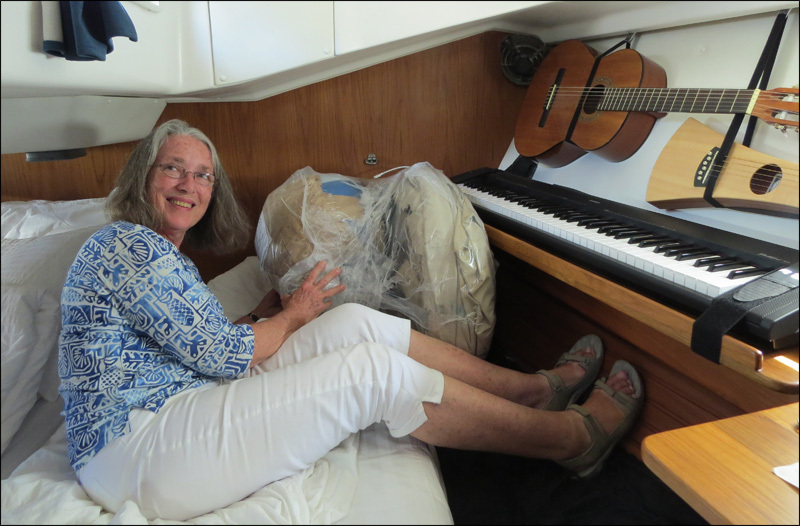 For Pat Hayes, who gave up a top job in Microsoft, and his wife Janet, there was a more personal quality to the voyage as she asked her husband to renew their marriage vows on board their Lagoon 45 catamaran Chapter Two before setting off. Janet set about making the boat as homely as possible, and perhaps her most prized possession on board is her sewing machine, which most impressed local school children when they visited the boat in Jamaica, especially when she informed them it could run solely on energy from the boat’s solar panels. 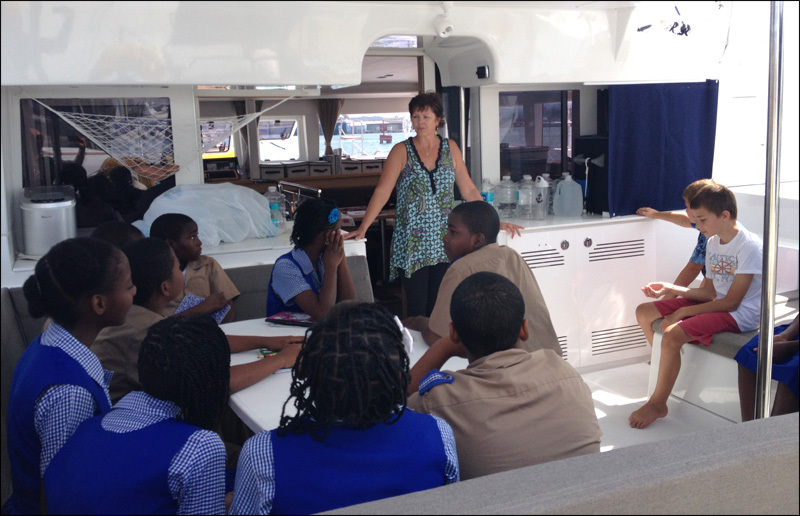 The visit by Jamaican students was part of the Blue Planet Odyssey educational programme. Sailors have set up links with schools in their home towns across the USA, Canada and the UK, so students can follow their progress around the world. In every stopover local children have been invited to come on board, while the sailors have visited classrooms, given presentations and set up Skype conferences with their classes back home. One of the aspects of the Blue Planet Odyssey that especially interests students and their teachers is the science programme. 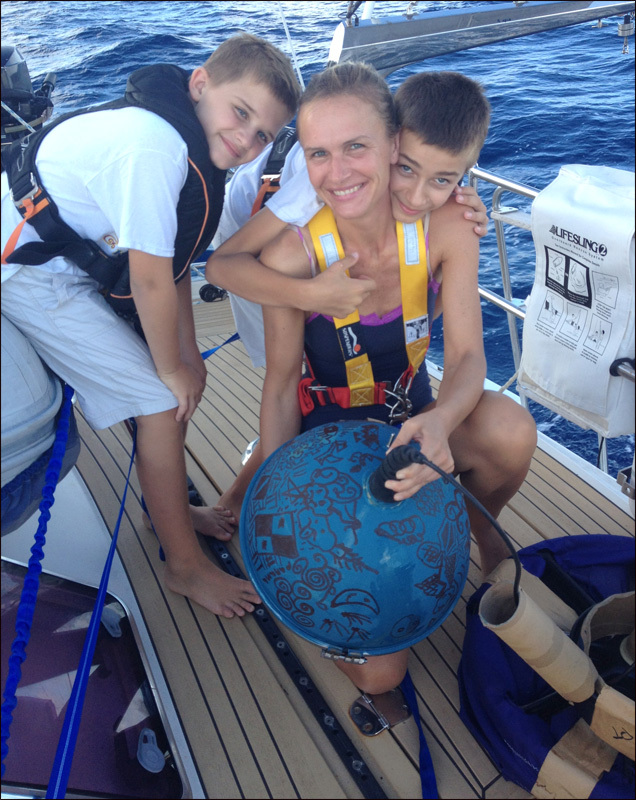 Odyssey sailors have already successfully deployed drifter buoys in the Atlantic during the Atlantic Odyssey in 2013 and 2014 as part of a unique partnership with UNESCO’s Intergovernmental Oceanographic Commission and the World Meteorological Organization. Drifter buoys float on ocean currents, equipped with meteorological and oceanographic sensing instruments that automatically gather data on barometric pressure, salinity and wind, as well as sea surface temperatures which is then transmitted via satellite back to a large global data base. Until now deployment has been largely concentrated on the major shipping routes, leaving data gaps which scientists and meteorologists are keen to eliminate. By using yachts, that sail off the beaten track, to help with deployments, these gaps in global coverage can start to be filled. The Odyssey yachts loaded ten drifter buoys on board before their departure from Key West, as NOAA (the United States’ National Oceanic and Atmospheric Administration), which manages the Global Drifter Program on behalf of the international community, is based in Florida. The drifters were all successfully deployed by the boats after leaving Panama, en route to the Galapagos Islands and French Polynesia, and are now busily transmitting their invaluable data back home. 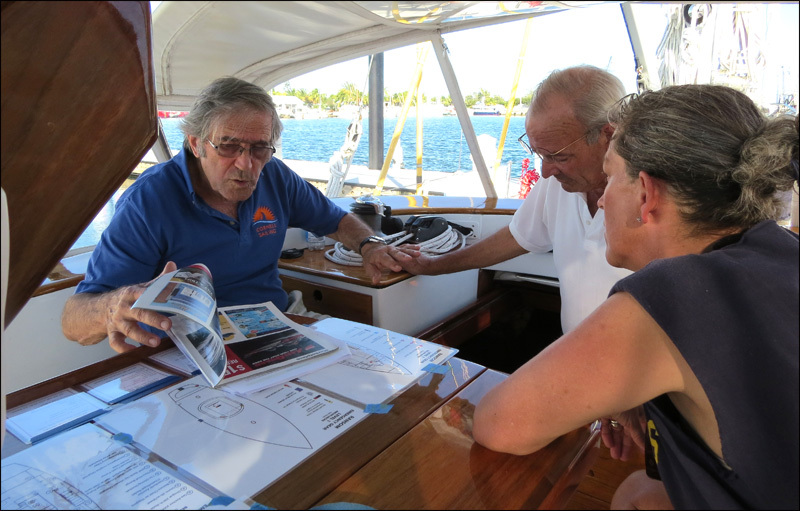 British sailor Terry Singh, and his American wife Dena, who sailed from San Diego on their Amel 54 Libby to join the fleet in the Galapagos, volunteered to take on board eight Argo floats supplied by the Scripps Research Institute. These state of the art probes drift on the surface of the ocean before descending to a depth of 1000 metres and, by changing their buoyancy, every ten days dive to a depth of 2000 metres. Returning to the surface, they transmit by satellite all the vast data that had been collected, before resuming the cycle. As there is a substantial gap in Argo coverage along 5°S in the eastern Pacific, the Argo floats had to be deployed in a specified line which was something of a challenge for a small sailing boat. 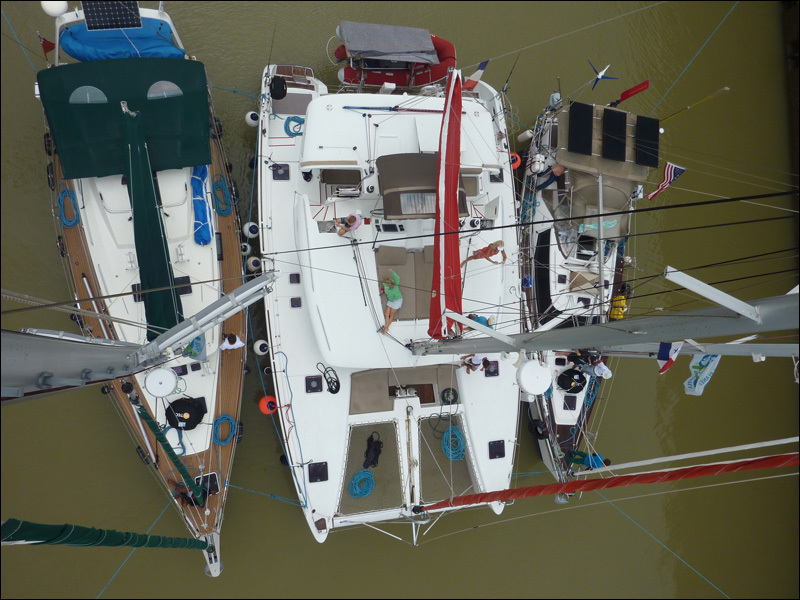 Terry and Dena enlisted the help of British sailors Chris and Jess Wallis on the Lagoon 400 OM and they deployed four floats each. Data from the Argo floats has been crucial in demonstrating that much of the recent planetary warming has occurred in the deep ocean. While sea surface temperatures have risen more slowly in recent years, heat has been absorbed throughout the ocean, a fact of which scientists are only now becoming aware. In the simple act of placing a float into the sea far from land, sailors can thus play a crucial role in expanding our knowledge about the state of the ocean. 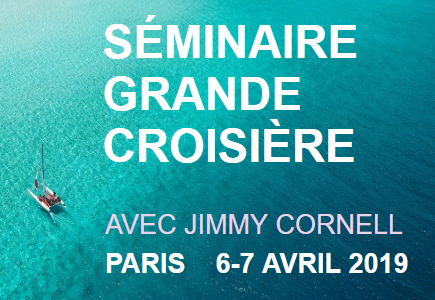 The Blue Planet Odyssey is Jimmy’s fifth round the world rally and its route follows a pattern he has perfected over the years, with fixed starts and finishes to some legs punctuated by more leisurely cruising periods timed to coincide with the optimum weather conditions in the most attractive destinations. 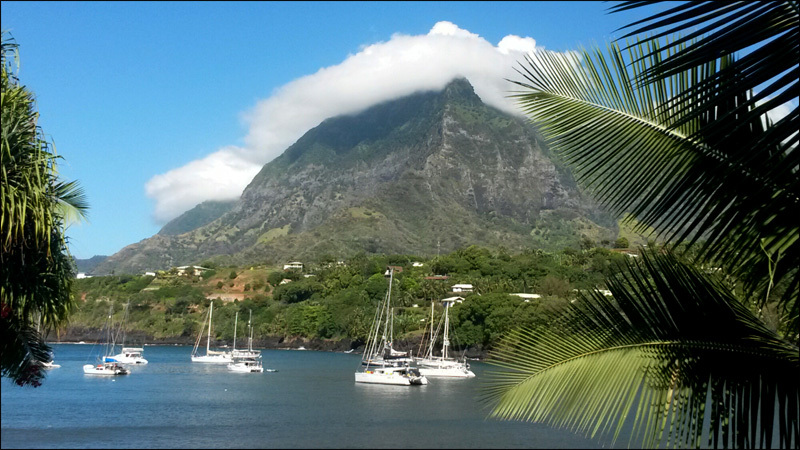 Through April and May this year, therefore, the sailors have time to explore French Polynesia, moving on from the Marquesas to the Tuamotus and the Society Islands. For the next section of the rally they will head off the beaten track to the remote islands of the Northern Cooks, Tokelau, and Tuvalu, island nations which are right at the front line of climate change both in its threats, and also its solutions. The tiny island state of Tokelau, for example, aims to be one of the first nations in the world to get all its power solely from renewable energy. Discussions are underway with the Red Cross and other organisations as to what useful assistance the boats might be able to provide when they arrive in Vanuatu in August. The remainder of 2015 will see the fleet head to the Great Barrier Reef, before continuing on to Indonesia and finishing the year in Thailand. In 2016 the yachts will cross the Indian Ocean bound for South Africa and back into the Atlantic, completing their circumnavigation in the Caribbean or North America, depending on where they started. Returning to that 2012 airborne conversation, Jimmy mentioned one other place most threatened by climate change: the Arctic. Transiting the Northwest Passage has been a sailor’s dream for hundreds of years and the shrinking ice caps are finally making it possible. In the summer of 2014, on his new yacht, Aventura, a Garcia Exploration 45, Jimmy attempted the transit as part of the Blue Planet Odyssey’s Northern Route. I accompanied him with my 15 year old daughter Nera. The Arctic is an unpredictable place and despite record lows of summer ice, we did not make it through. Meanwhile the Arctic still has its grip on Jimmy and he is planning another attempt at the NWP. I will not be joining him this time. 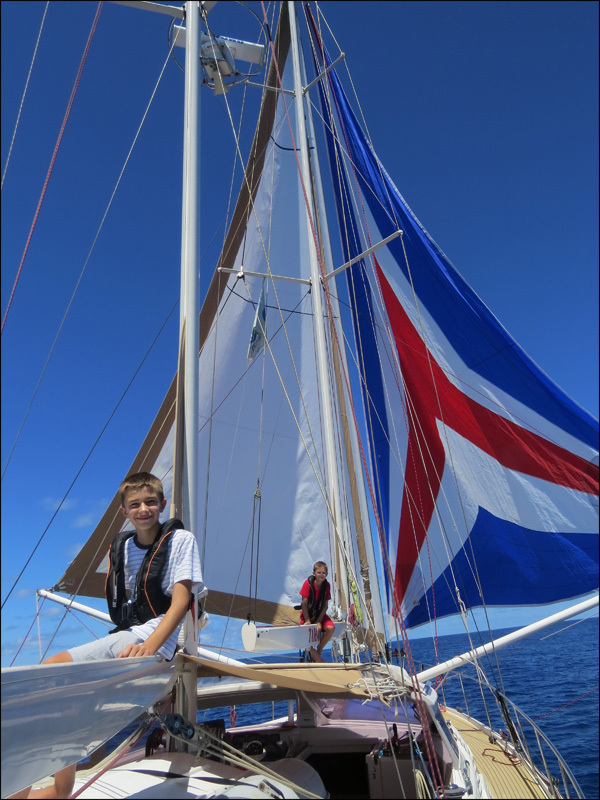 Warmer waters are calling me: my son Dan and myself will be willing crew as we join the Australian yacht Drina in Samoa and head off to Tokelau, Tuvalu and Vanuatu. Nearly 40 years on I will finally return to those places where we received such a warm welcome. I hope our visit will at least encourage those islanders that sailors do know and care about their plight. After all, we share one crucial thing – we live close to the ocean and depend on its health for our wellbeing and our livelihood. This article was published in the June 2015 issue of Cruising.